I searched for a prior posting here on Thunderbolts but didn't find it. The role of dust in cosmic and laboratory plasmas was discussed early on by Irving Langmuir, Lyman Spitzer, and Hannes Alfvén, three pioneers of plasma physics in the 20th century.1 In a 1924 speech, Langmuir described the "profound effects" he observed in an arc discharge when minute droplets of tungsten vapor were sputtered from the cathode into the plasma. He ascribed the unusual effects to the attachment of electrons to the droplets, causing them to become negatively charged and thus move about under the influence of the electric fields within the discharge. It seems clear that Langmuir was describing the first laboratory observation of a dusty plasma. Spitzer, in 1941, first discussed the processes by which dust particles in the interstellar medium acquire charge. He pointed out that, in addition to photoelectric charging by UV radiation, the dust particles acquire a negative charge due to their immersion in an ionized gas, even though the system's net charge is zero. The dust particles become negatively charged simply because their encounters with the swift electrons are more frequent than with the lumbering ions. Alfvén, in his 1954 monograph On the Origin of the Solar System, considered how the coagulation of dust particles in the solar nebula could have led to planetesimals and subsequently to comets and planets. Over the past 20 years, the publication rate on the subject of dusty plasmas has grown exponentially, spurred by two watershed discoveries. The first occurred in the early 1980s. Images of Saturn's rings taken by Voyager 2 revealed certain features in the B ring that were probably as mysterious to modern planetary scientists as the rings themselves were to Galileo in 1610. The Voyager images (see figure 1) revealed a pattern of nearly radial "spokes" rotating around the outer portion of Saturn's dense B ring.2 As the spacecraft approached the planet, the spokes first appeared dark against the bright background. But as Voyager 2 withdrew from the Saturnian system, the spokes appeared brighter than the material around them. This observation—that the spoke material scatters sunlight more effectively in the forward direction—indicated that the material is a fine dust. Perhaps the most interesting aspect of the discovery of the spokes was that they are not stationary structures. Indeed, they develop remarkably fast, with new spokes forming in as little as five minutes. This short dynamical time scale rules out explanations based solely on gravitational effects, indicating that the dust particles are affected by electromagnetic fields. The first proposals that the spokes might consist of charged dust came from Jay Hill and Asoka Mendis at the University of California, San Diego, and independently from Christoph Goertz and Greg Morfill in Germany.3 Goertz and Morfill showed that the charged dust particles were electrostatically levitated about 80 km above the ring plane. They attributed the charging to bursts of plasma generated in localized regions by micrometeoroids that sporadically plunge into boulders in the rings. The insertion of the Cassini spacecraft into orbit around Saturn as this issue of Physics Today goes to press should provide the dusty−plasma community with another boost of exciting results. Cameras aboard Cassini, with higher spatial and temporal resolution than Voyager's, will give us a much−improved view of the formation and evolution of the spokes. The second crucial development in dusty−plasma research, in the late 1980s, expanded the field across disciplinary boundaries. Scientists in the semiconductor industry, rather than astrophysicists, stumbled onto a significant discovery as they searched for the source of particulate contamination of semiconductor wafers. It had been widely believed that particle contamination of silicon substrates occurred mainly during handling of wafers in air. So attention was focused on improving clean−room standards. Nobody thought to check whether the contamination might be happening inside the plasma processing reactors that are used to deposit and etch thin films on the wafers. But then Gary Selwyn of IBM made a serendipitous discovery. He was carrying out a routine measurement with laser−induced fluorescence, to determine the concentrations of reactive gases in a plasma.4 When Selwyn shined his laser into the plasma, his attempted measurement of weak optical fluorescence was overwhelmed by scattering of the incident light. The laser light was illuminating clouds of micron−sized particles electrically suspended in the plasma above the wafer (see figure 2). Selwyn found that particles actually formed and grew in the gas phase (see box 1), aggregating material from gases that were thought to have been exhausted by the vacuum pump. Then, at the fateful moment when the plasma−generating RF power was switched off, the particles fell and contaminated the wafer. Selwyn's discovery revealed that much of the particle contamination responsible for costly yield losses was happening not just anywhere in the clean rooms, but inside the plasma reactors. Whereas a dusty plasma is something of enduring interest to an astronomer, it was a vexing problem to be avoided by the semiconductor manufacturer. Nevertheless, the two communities suddenly found common ground. Both needed to understand the charging mechanisms and the forces that transport particles from one place to another in a plasma. But not all the progress was visible; secretiveness is often the rule in the semiconductor industry. Successful solutions are often hidden away as proprietary secrets. Some solutions are known to involve plasma−chamber designs that exploit various forces on particles to divert them toward the vacuum pump. There have also been changes in the method of coupling RF energy to the plasma. Rather than relying solely on capacitive coupling, manufacturers now commonly also use inductive coupling to power a plasma−processing reactor. As a result, the electric fields are too weak to levitate particles large enough to cause killer defects on etched wafers. The discovery by the semiconductor industry that RF−powered plasmas can levitate dust particles turned out to be a boon for basic plasma physicists, who study such things as waves and instabilities in ionized gases. Plasma physicists had heard astronomers talk of dusty plasmas in space, and they were eager to study them. The laboratory experimenter, however, has the difficulty that dust particles, unlike plasma ions and electrons, are so massive that they fall rapidly to the bottom of the chamber. Experimenters needed a way to fill a volume of plasma with particles, but gravity seemed sure to thwart them. Then came Selwyn's unexpected discovery. Immediately after the appearance of his 1989 paper, plasma experimenters worldwide realized how they could levitate particles in an RF−generated plasma. Soon, other laboratory methods of filling a plasma volume were developed as well. One can, for example, maintain a dusty plasma by constantly showering particles in from above. Much of plasma physics is devoted to developing controlled nuclear fusion. Igniting a fusion plasma requires heating deuterium and tritium nuclei to temperatures above 100 million kelvin. At such high temperatures, however, any solid material is vaporized and highly ionized. Therefore nobody expected that dust particles could exist in a fusion plasma, much less that they could be a source of concern.5 It turns out, however, that a magnetically confined fusion plasma is in many ways dominated by the conditions at its edges, where it comes near material surfaces. The outer portions of the plasma typically have temperatures hundreds of times cooler than its center. In this more benign edge plasma, solid particles can survive briefly. Indeed, inspection of the bottoms of magnetic−confinement fusion devices after periods of operation shows the presence of fine dust particles. The particles originate from the solid surfaces exposed to the plasma. Ion bombardment of the lining material (often graphite) liberates atoms that are thought to form dust particles and deposit thin films on other chamber surfaces. As semiconductor engineers know too well, such films easily flake off, creating dust particles that fall down. In a fusion energy reactor, the ion bombardment would be ferocious and long lasting, and the resulting accumulation of dust could be enormous. That poses safety issues because dust particles can retain hazardous quantities of radioactive tritium. for the charge Q acquired by the particle. In laboratory dusty plasmas, except under special circumstances, one only needs to consider contributions from electron and ion currents. Because the electrons typically move much faster than the positive ions, an isolated particle immersed in a plasma acquires a negative Vs and thus repels electrons. That lowers the electron current and raises the ion current, thus ensuring that the net current at equilibrium is zero. for the surface potential on a particle immersed in a hydrogen plasma, assuming that the temperature T is the same for the electrons and the ions. For a particle of 1−μm radius in a plasma with kT = 3 eV, equations 2 and 3 predict a charge of −8.4 × 10−16 C. That's about 5000 times the electron charge − e. This electron excess is large enough that the statistical spread and temporal fluctuation of charge are quite small in experiments that use plastic microparticles of uniform size and composition. Still, the charge−to−mass ratio of a plasma microparticle is very much smaller than that of an ion. Experimenters have devised several methods of measuring dust−particle charge. For example, they can measure the charge on an individual grain by letting it fall into a Faraday cup, or they can determine the depletion of electron density on dust or the speed of plasma waves.9 Such methods have verified, among other things, that a particle's charge scales linearly with its diameter and that the charge is diminished by the presence of other particles nearby. In ordinary electron−ion plasmas without dust, the charge on the ions generally remains fixed, even in plasmas containing negative ions. But in a dusty plasma, the charge on a particle does not stay fixed. Because the charge depends on the particle's surface potential relative to the plasma potential, fluctuations in the plasma potential brought about, for example, by plasma waves can cause the dust charge to vary. The charge also varies stochastically, as individual electrons and ions are absorbed at random times. For nanometer particles, this effect can actually switch the charge's sign. Such alternation can enhance the growth rate of particles by collision or coagulation in the dusty plasmas of semiconductor manufacturing reactors and prestellar nebulae. The study of waves and instabilities has always been important in plasma physics. The addition of dust particles to a plasma generates many new problems to study.6,9 Theoretically, dust effects have been investigated by extending the usual two−fluid treatment of plasmas with the addition of a third component—the dust. The consequences fall within two categories. First, although dusty plasmas, like most plasmas, are electrically neutral overall, there is an important difference. In a dusty plasma, a large fraction of the negative charge is bound to the particles. This binding is typically observed by noting the precipitous drop in electron current when dust is dispersed into a plasma. The depletion of electrons by absorption on the dust particle affects all kinds of plasma wave modes. For example, ion acoustic waves—the plasma analog of sound waves—propagate at higher velocities and experience far less damping in plasmas containing negatively charged dust particles. One striking aspect of these dust waves is that they can be imaged by a video recording of the scattered light. The usual compressions and rarefactions associated with the acoustic wave appear in figure 3 as bright and dark regions that propagate at the dust acoustic speed. Because the charge−to−mass ratios of the dust particles are very small, the wave propagation speed is very slow—only a few centimeters per second. Plasma is often termed "the fourth state of matter" because adding energy to a solid converts it first to a liquid, then to a gas, and finally to a plasma. With a dusty plasma, this progression closes into a circle. It is a plasma that can have the properties of a liquid or a solid. It forces us to reconsider exactly what is meant by the term plasma. Defining plasma as a collection of positive and negative charges that are not atomically bound to one another, we encounter two possibilities. Most commonly, the charges have abundant kinetic energy and fly easily past their neighbors, much like molecules in a gas. That's termed a weakly coupled plasma. The obverse is the less common strongly coupled plasma, which has charged particles whose kinetic energy is much less than the electrostatic potential energy between neighbors. Previously, the best−known strongly coupled plasmas included the interiors of stars and laser−cooled ion aggregates. In stellar interiors, the ratio γ of electrostatic to kinetic energy is large because of high density and small interparticle spacing. In laser cooling, γ is large because the ion temperature is so low. Now we have another way of making a strongly coupled plasma. In 1986, Hiroyuki Ikezi predicted10 that dust particles in plasma could acquire enough charge to produce a large γ. As soon as Selwyn had discovered a means of levitating dust particles, experimenters began making dusty plasmas that were indeed strongly coupled. By their mutual Coulomb repulsion, the suspended dust particles can organize themselves into spectacular crystal−like arrays (see box 2).11 These arrays are reminiscent of the "Wigner crystals" whose existence in the electron seas of metals at sufficiently low temperature was predicted by Eugene Wigner in the 1930s. The hexagonal monolayer array of 8−μm−diameter plastic microparticles shown in box 2 is called a Coulomb crystal. One manifestation of phonons that is uncommon in molecular solids is the so−called Mach cone, a V−shaped wake created by a moving supersonic disturbance. In a laboratory dusty plasma, Mach cones are made by applying force to the particles by means of laser light. Using a setup like that shown in box 2, one of us (Goree) and coworkers swept an argon laser beam across a monolayer suspension of plastic microparticles.12 The laser sweep caused a moving disturbance. The microparticles were illuminated for imaging by light from a much weaker helium−neon laser. A Mach cone resulting from the disturbance is shown in figure 4. It's a superposition of acoustic waves, or phonons, whose wavefronts overlap constructively to concentrate energy in a moving V−shaped pattern, similar to the wake of a supersonic bullet in air. The cone's opening angle θ is related to the Mach number M ≡ v/c by sinθ = 1/M, where c and v are, respectively, the acoustic speed in the medium and the supersonic speed of the disturbance. The acoustic speed depends on the temperature of the dust fluid and the charge and mass of the dust particles. Ove Havnes and coworkers at the Auroral Observatory in Tromso, Norway have suggested that Mach cones might be found in planetary rings, produced by big boulders plowing through fields of charged dust.14 While the boulders keep pace with the Kepler orbital velocity, they argue, the Lorentz force of the planet's magnetic field could modify the orbital motion of the charged dust. A remote search for Mach cones in Saturn's rings with viewing instruments aboard the Cassini spacecraft could yield information about the dusty plasma conditions in regions through which Cassini would not survive direct transit. The remote imaging is possible because the dust particles scatter sunlight. As the dust concentration is compressed and then rarefied in the waves that compose the wakes, it will appear brighter and then dimmer. Measuring a Mach cone's opening angle would yield information about dust parameters such as the particle size. The experiment is a German−Russian collaboration. The plasma chamber, built in Germany for the space station, has been named the Nefedov Plasma Crystal Experiment in honor of Anatoli Nefedov, a leader of the Russian contingent who died in 2001. The apparatus, similar to the one shown in box 2, is about the size of a microwave oven. A video image of one of the dust structures (figure 5) shows a variety of features, including a sharply defined void in the center, a stable crystal−like array below the void, and fluid vortices along the horizontal axis and outer edges. In the absence of gravity, one has the opportunity to see both liquid− and solidlike phenomena as other forces emerge to affect the dynamics of the dust. Charged dust particles in plasma are affected by their mutual electrostatic interaction and by interaction with gas molecules and ions. Thermal gradients produce thermophoretic forces. Ion drag, which can be the dominant force under weightless conditions, is thought to have caused the void seen in figure 5 by pushing dust particles out of the center of the plasma chamber's RF discharge. At an altitude of about 85 km, well below the orbiting ISS, there's a fascinating example of a naturally occurring dusty plasma: the so−called noctilucent clouds. These "night−shining" clouds, seen at high latitudes in the early summer months, are composed of ice crystals. The clouds form in the polar mesosphere, where temperatures can get down to 100 K. At this lower reach of the ionosphere, free electrons can attach to the ice particles (typically 50 nm across) to form a dusty plasma. Noctilucent clouds are perhaps related to observations of unexpectedly strong radar echoes from the polar regions.16 The enormous backscatter cross section observed in the summer mesosphere came as quite a surprise to radar scientists. Models have been developed to relate charged dust to localized ionization and electron depletions that would result in upper−atmosphere inhomogeneities strong enough to account for the abnormal radar echoes. But there is, as yet, no consensus. Curiously, there has been an increase in the observed frequency of the noctilucent clouds over the past 30 years. The increase may be caused by rocket engine exhaust, which is mostly water vapor. Water vapor released at very high altitudes tends to collect near the poles. Ironically, work on dusty plasmas has been carried out over the years by groups with entirely opposite motivations. Initially, industrial scientists and engineers worked feverishly to eliminate dust from plasma−processing devices. Meanwhile, physicists doing basic plasma research were devising schemes to get dust into plasmas so that they could study its effects. As is often the case, researchers in these varied disciplines barely knew of each other's existence, rarely talked with each other or attended the same meetings, and seldom published in the same journals. Eventually, however, they were brought together by the realization that they were investigating the same basic phenomena. Nowadays they share in plasma−source development and diagnostic techniques. Much progress has also been made in recent years in the theoretical and numerical analysis of dusty plasmas. Dusty plasmas challenge modelers for a number of reasons. For example, the dust motion occurs on a much longer time scale than that of the ions and electrons, and the dust might have a distribution of particle sizes. The charge on the particle is not fixed. 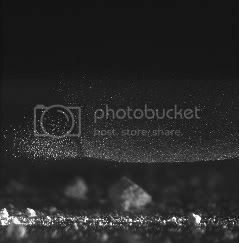 Futhermore, the dust particles can be strongly coupled to each other via short−range forces. That's entirely different from dust−free plasmas, whose constituents interact through relatively weak, long−range forces. Nonetheless, so−called particle−in−cell (PIC) methods are being successfully applied to dusty plasmas. The methods can handle the inclusion of realistic complications such as ion−dust collisions and nonspherical particle shapes. Figure 6 shows the result of a PIC calculation, by Martin Lampe and colleagues at the Naval Research Laboratory in Washington, DC, of the three−dimensional potential around a negatively charged dust grain immersed in a plasma with flowing ions.17 Although the upstream potential is typical for a shielded negative grain, a complex structure downstream shows an electrostatic wakefield formed by positive ions that are focused into the region immediately behind the grain. The calculated formation of this positive region helps explain a pervasive experimental observation in dust crystals—namely, the tendency for grains to align directly behind one another along the direction of ion streaming. The imposing intellectual range of physics issues touched on by the study of dusty plasmas extends beyond plasma physics to include, for example, the solid−liquid melting transition and vortex flows in fluids. And size range of dusty−plasma applications extends from microgrooves in semiconductor devices to the magisterial rings of Saturn. Robert Merlino and John Goree are professors of physics at the University of Iowa in Iowa City. Plasma systems for processing silicon wafers typically ionize a gas by means of a parallel−plate arrangement powered by a 13.56−MHz RF source. Wafer etching is done in a plasma formed from a combination of a buffer gas (usually argon) and silane (SiH4), a highly reactive gas. This plasma environment creates unwanted dust particles. For example, plasma−assisted chemical reactions lead to the formation of SiO2 particles by accretion and coagulation of molecular ions. The growth of these particles from a few nanometers to microns can be monitored by scattered laser light and electron microscopy. The micrograph at right (adapted from L. Boufendi, A. Bouchoule, Plasma Source Sci. Tech. 3, 262) shows particles roughly 45 nm across. The particles acquire negative charge by collecting electrons from the plasma. As the particles grow bigger, their number falls (see the graph). They eventually settle to the lower "sheath" of the plasma, levitated at heights where the plasma's quasistatic electric field balances them against gravity. Because electrons are so much lighter than ions, the plasma generates quasistatic fields (the red arrows) near both electrodes. Dust particles of various charge−to−mass ratios find stable resting places at slightly different heights above the lower electrode. Eventually, when the RF discharge is turned off, the particles fall onto the wafer substrate, contaminating it. A particle larger than half the width of an etched feature on the wafer can cause a "killer defect." Such defects result in costly reduction of manufacturing yield. In a number of experiments, one of us (Goree) and coworkers formed plasmas by applying RF power to the 23−cm−diameter electrode at the bottom of a parallel−plate plasma chamber like that shown in box 1. From a "salt shaker" above the electrode, we sprinkled 8−μm−diameter plastic spheres into the plasma. The particles acquire negative charge by collecting electrons from the plasma. Thus they become levitated as a horizontal monolayer several millimeters above the lower electrode. Negatively-charged dust particles in plasmas can form crystal-like structures. Mitsuhiro Nambu, Sergey Vladimirov and Osamu Ishihara have suggested that the mechanism by which this occurs may be analogous to the effect which produces superconductivity. Recent experiments have revealed that the particulates embedded in plasmas have an intriguing tendency to form crystalline structures - i.e. regular, repeating arrangements of particulates. The formation of these structures has been difficult to explain because the electrostatic forces between the negatively-charged dust particles themselves are repulsive, since particles with the same sense of electric charge repel one another. Prof. Mitsuhiro Nambu (Kyushu University; currently at Tokyo Metropolitan Institute of Technology), Sergey Vladimirov and Prof. Osamu Ishihara (Texas Tech University; currently at Yokohama University) have suggested that the explanation may lie in collective effects, where large numbers of the particles act in a coherent manner, between the dusty particles and the flow of positively charged ions through the static crystalline structure towards the negatively charged electrode near which the crystalline structure forms. These effects are analogous to the formation of so-called ``Cooper pairs'' of electrons that give rise to superconductivity, and this theory explains the formation of both square and hexagonal crystals, as observed experimentally. A crystal-like structure can be formed out of charged dust grains in a low-temperature plasma discharge and in space plasmas such as Saturn's rings. Sergey Vladimirov and Neil Cramer have found that the grains in the crystal vibrate with definite frequencies. This will aid in the experimental diagnostics of the crystal and its background plasma. Dust particles can form a crystal structure known as a Coulomb solid. The crystal spacing can be large (of the order of millimeters), so the dust crystal provides a macroscopic, classical model of a solid state crystal. The characteristic frequencies of the vibrations are dependent on the parameters of the plasma and the dust grains, such as the grain charge, and so measurement of the frequencies could provide diagnostics of these quantities. Well this did not get the push it deserves. I invite everyone to read this online book. plasma crystals are so interesting as is dusty plasma. The implications are staggering for cosmology and the EU evidence we are looking for and we keep finding that a gravity controled universe is not a reality. It turns out that colloidal plasma science and dusty plasma physics, which also interacts with condensed matter physics, make plasma physics a truly cross-disciplinary and very fascinating science with wide ranging applications in space and technology. Most of the contributions from the Trieste meeting appear in this Topical Issue of Physica Scripta, which will be distributed to all the participants. It is expected that the papers of the present proceedings, which systematically describe the advancement of the physics of weakly and strongly coupled dusty and colloidal plasma systems, shall be useful for understanding the many complex phenomena that are occurring in space and laboratories. Some NASA experiments on plasma current from dust charge. You can see it in your own home when you light a candle. A flame is a very weakly ionized plasma that contains soot particles. The high degree of ionization in ordinary hydrocarbon flames (five orders of magnitude higher than that predicted by the Saha equation) is due to thermionic electron emission from 10 nm particles of unburnt carbon (soot). Still hurting my eyes in scanning all the papers concerning experiments. The wave-propagating experiments are really interesting. Also the relation to comets can be quite enlightening, maybe. - Nonetheless, there are quite a few related discussions. One is the Cymatics thread. Here's another one. _Sweeping sands across the Sahara and other dune expanses are blown by more than just wind, scientists have discovered. Powerful electric fields spring up near the desert floor and propel sand grains into the air. _By accounting for this electricity, researchers say they can design better climate change models, and even explain features of the dust on Mars. _Scientists have long been at a loss to explain why sand sweeping across the desert doesn't bounce higher when the wind gets stronger. But when researchers at the University of Michigan made the first calculations of electricity's role in this dance of particles, they were finally able to match their models with observations. - Quote: Powerful electric fields spring up near the desert floor and propel sand grains into the air. - That's very gratifying news to me, as I was wondering a few months back why the Sahara seems to have stripes all over it, when seen from satellite views. The stripes go all the way to Saudi Arabia and beyond. - Now get this. There is a similar striped pattern all over Greenland in the snow. I didn't check Antarctica or the North Pole etc. But I'll bet those stripes are also due to electric forces directing wind flow. - I was seeing similar stripe patterns somewhere else recently in satellite images, but I don't recall where they were. - I don't think I've seen stripes on Mars, but I was just remembering the huge dust storms there have a line of dozens or more dust devils moving parallel to each other across the surface [which should produce a striped pattern too]. - So here's a prediction. The Sahara and Greenland etc probably have similar lines of dust devils marching along evenly spaced from each other, producing the stripe patterns. - I hope someone tells DaveS that this thread should be a pick of the week. - @rc-us or someone on the Cymatics thread said the stripes in the Sahara's sand and Greenland's snow may relate to vibrations, which is what Cymatics is about. Well, I guess there are a number of ways that electrical forces may involve vibrations. Could such vibrations cover an area as big as the Sahara or Greenland. We know the answer is yes, but which specific vibrations would those involve? Sound waves? - Thornhill likes to emphasize the habit of electrical discharges to machine solid [& other?] surfaces and pulverize much of the eroded material into fine powder [or sand? or snow?] and deposit it in layers in another area or on a different [celestial] body. Circuit board etching etc is obviously the same phenomenon. - I wish I had time to read you guys' links etc. - Nonetheless, there are quite a few related discussions. Ik wrote: @rc-us or someone on the Cymatics thread said the stripes in the Sahara's sand and Greenland's snow may relate to vibrations, which is what Cymatics is about. Well, I guess there are a number of ways that electrical forces may involve vibrations. Could such vibrations cover an area as big as the Sahara or Greenland. We know the answer is yes, but which specific vibrations would those involve? Sound waves? -I read an article a long time ago that mentioned the fact that with certain winds the dunes in the Sahara sometimes produces wisthling and thunderous sounds. They were able to explain how the shape of the sand itself was responsible (with the wind of course). Neither Douady’s nor Andreotti’s analysis explains why some dunes do not sing,” says Melany Hunt at the California Institute for Technology (Caltech), who together with co-workers has made extensive measurements of singing dunes using techniques such as radar. “Because we have not observed any dependence of the frequency on grain diameter, and because we can physically feel the sound over a large area of the dune, we have concluded that the sound depends on the dune itself and not on individual grains.” In particular, Hunt and her colleagues have found that dunes have a layered structure that they say causes a dune to act as a waveguide, in which certain frequencies are preferentially propagated. “As for Douady’s moving-blade experiment, we don’t agree that pushing sand in this way is the same physical phenomena as what one finds in the desert,” she adds. Ik wrote: - I wish I had time to read you guys' links etc. All the posts that I located for recovery. Introduction: Dusty plasmas have become a topic of great interest because they provide an excellent tool for exploring many of the fundamental assumptions used in plasma physics. A dusty plasma consists of electrons, ions, neutral gas, and charged microparticles ("dust") with diameters ranging from a few nanometers to a few micrometers. They exist naturally in space, being found in the low Earth orbit region, planetary rings, comet tails, and in planetary nebulae. From its early beginnings with observations of astrophysical phenomena, this area of plasma physics research has grown to encompass industrial plasma, space plasma, and basic plasma issues ranging from strongly coupled systems, to transport, to waves and instabilities. In the laboratory, experiments have evolved from observations of the behavior of the microparticles in the plasma to direct manipulation of the microparticles and use of the microparticles themselves for plasma diagnosis. However, most dusty plasma experiments have been performed in relatively small setups, most often with dust cloud scale sizes of the order of 2-3 cm. DUPLEX: The Naval Research Laboratory (NRL) DUPLEX—the DUsty PLasma EXperiment—device was developed to investigate fundamental issues in the physics of large-scale dusty plasmas in an environment far from the chamber boundaries. The chamber, shown in Fig. 8 with plasma, is unique among laboratory dusty plasma devices. It is 80 cm in diameter and 80 cm in height and is constructed from 0.5-in. thick optically transparent polycarbonate plastic, providing a 360° view of the experimental region. The top and bottom endcaps of the device are also transparent. Alumina microparticles with an average particle diameter of <d> ~ 1.2 ± 0.5 mm are typically used in these experiments. Dusty plasmas of the size and nature observed in the DUPLEX device can be generated because there are none of the usual sheath effects near the walls that are present in most smaller experiments. This allows the dust clouds to expand to the size where an equilibrium is achieved between the mutual repulsion of the negatively charged microparticles and an inward pressure force from the plasma. The dust cloud internal structure suggests a possible underlying electrostatic potential structure in the region where the particles are suspended. Because these highly structured clouds form above the dust sources, it is possible that the insulation provided by the unlevitated dust on the cathode alters the local potential profile directly above the source. Future work on this experiment will focus on the nature of the formation of such void structures by using electrodes to control the potential structures in the plasma. The Electron Dust-Ion Cyclotron (EDIC) instability is a modification of the usual Electron Ion Cyclotron (EIC) instability in normal plasmas. The EIC instability is produced in Q-machine plasma by drawing an electron current along the axis of the plasma column. A small disk is placed at one end of the plasma column, which is biased slightly above the space potential of the plasma. The produced electron drift is sufficient to excite electrostatic waves with a frequency slightly above the ion gyrofrequency, which propagate radially outward, nearly perpendicular to the magnetic field. In order to study the effect of dust on the instability, measurements of the wave amplitude were taken, and compared to identical plasma conditions where the dust dispenser was turned on. This amplitude could then be used as an indication of the effect of dust on the plasma. In the experiments, it was found that the EDIC instability could be excited simply by injecting dust into the plasma, in agreement with theoretical predictions. In a similar experiment, a grid was used to launch ion acoustic waves into a dusty plasma column. The grid was biased several volts negative relative to the space potential, and a sinusoidal pulse of ~20-80 kHz was applied. The disturbance created then traveled down the plasma column as an ion-acoustic wave. By altering the amount of dust (and the amount of negative charge attached to the dust grains), it was found that wave damping decreased and the phase velocity increased as the dust density was increased by injecting more dust into the plasma column. The second experiment involving ion acoustic phenomena used a small anode to draw a current through the entire cross section of the plasma column. In a normal Q-machine plasma this will lead to low frequency potential relaxation (PRI) oscillations. It was found that when dust was injected into the plasma column, the PRI oscillations (f ~ 1.5 kHz) were quenched while somewhat higher frequency (f ~ 3-5 kHz) oscillations were generated. These oscillations were identified as the dust-modified ion-acoustic (DIA) waves. (A similar effect has been observed in a negative ion plasma.) The frequency of the oscillation also depended on the amount of negative charge attached to the dust. Reasonable theoretical agreement supports the identification of these waves as DIA oscillations. To observe the low frequency dust acoustic mode it was necessary to develop a method for trapping dust grains within a plasma for long periods of time. To this end, these experiments were performed in a double plasma device, where the discharge plasma was used to form an anode double layer. This double layer had strong enough electric fields to suspend dust against gravity, allowing dust grains to participate in dynamic wave motion. If the discharge current was sufficient, acoustic waves could be visibly seen propigating through the suspended dust cloud. The waves were easily visible through the use of light scattering from a bright lamp placed behind the dust cloud. Once the waves were observed a way to deterimine their dispersion properties was devised. Using a programmable high voltage power supply, the current provided to the anode was pulsed at frequences from 5-30 Hz. With this known frequency, video images (examples shown below) were analyzed to provide measurements of wavelength. The obtained dispersion relation could be plotted and measured directly. One of the problems encountered in the previous experiment was the interaction of suspended dust clouds with electrostatic probes. Once a probe was inserted into a dust cloud, the probe would often completely disrupt the dust cloud. This experiment attempted to perform another diagnostic using a moving object in a dust cloud. The formation of a cavity in the still and moderate speed cases was not expected. A reasonable radius for this cavity was obtained by a simple screening model, given that only the ions and electrons provide electrostatic screening in the dusty plasma. The dust grains in a complex (dusty) plasma strongly modify the physical behaviour. The origin, composition and physical properties of these grains are of fundamental interest. In space, dust plays an important role in the physics, chemistry, and dynamics of interstellar clouds, in the process of star and planet formation, in cool stellar envelopes, and in expanding nova and supernova shells. Within the solar system, dust occurs in cometary plasmas and in the magnetospheres of all the outer planets. The interactions of planetary rings with the magnetosphere (plasma production, absorption, and transport), as well as the ionosphere (mass injection, currents) are intensely studied phenomena. The unexpectedly complicated collective behaviour of the combination of plasma and charged dust grains is here studied theoretically and based on data from the complex plasma experiment on the International Space Station, ISS. (i) New theoretical results concern the test charge response of a dusty plasma including time-dependent charging of dust grains. Studies are also made of nonlinear structures (double layers, solitons) including dynamical charging effects. Typical experimental plasma parameters and dust grain sizes are favourable for studies of the coupling between grain charge relaxation and plasma oscillations. Experimental studies of charging mechanisms and measurements of charging rates are planned. (ii) A size distribution is expected for naturally occurring dust grains. Electrostatic waves may then be described using an equivalent non-Maxwellian velocity distribution, and the test charge response of the dusty plasma is studied. Experimentally, the electrostatic properties of a dusty plasma may be used to diagnose the size distribution of dust grains formed within the plasma. Sulphur Plasma Lamps are the new revolutionary light source with the highest effectivity and a true full spectrum similar to that of sunlight. We are now able to produce technical lighting solutions that would have been unimaginable just a short time ago. The sulphur lamp (also sulfur lamp) is a highly efficient full-spectrum electrodeless lighting system whose light is generated by sulphur plasma that has been excited by microwave radiation. The technology was developed in the early 1990s, but, although it appeared initially to be very promising, sulphur lighting was a commercial failure by the late 1990s. Since 2005, lamps are again being manufactured for commercial use. The sulphur lamp consists of a golf ball-sized (30mm) fused-quartz bulb containing several milligrams of sulphur powder and argon gas at the end of a thin glass spindle. The bulb is enclosed in a microwave-resonant wire-mesh cage. A magnetron, much like the ones in home microwave ovens, bombards the bulb, via a waveguide, with 2.45 GHz microwaves. The microwave energy excites the gas to five atmospheres pressure, which in turn heats the sulphur to an extreme degree forming a brightly glowing plasma capable of illuminating a large area. Because the bulb heats up considerably, it is necessary for an electric motor to spin the bulb while a fan cools it to prevent it from melting. The bulb is usually placed at the focus of a parabolic reflector to direct all the light in one direction. This is a common explanation for the heating which takes place in the solar corona. Electric currents, and in particular, magnetic-field-aligned electric currents (which are sometimes generically referred to as Birkeland currents), are also observed in the Earth's aurora, and in plasma filaments. And they have a link to Thunderbolts! Motivation:Dust grains suspended above the lunar surface have been observed on multiple occasions. For example, a horizon glow tens of centimeters above the surface of the Moon was detected by Surveyor 5, 6, and 7 (Figure 1) and more recently by the Clementine spacecraft. At spacecraft sunrise, Apollo astronauts observed high altitude streaks due to light scattered off particles extending from the lunar surface to above the spacecraft. Evidence for horizontal dust transport on the surface of the Moon at terminator crossings was also detected by the Lunar Ejecta and Meteorite Experiment (LEAM) deployed by Apollo 17. Dust dynamics such as these are thought to be the result of the interaction between charged dust particles and a photoelectron layer above the surface. Understanding the dynamics of dust near surfaces in space is important for many reasons. In the solar system, dust is continually released by the interplanetary micrometeoroid flux, ring particle collisions, and asteroid or meteor collisions. Therefore, many small, airless bodies in the solar system are coated with a dusty regolith. In addition to the observed lunar dust dynamics, dust levitation and transport may occur on Mars, Mercury, planetary satellites, planetary ring particles, asteroids, comets, and even planetesimals. Furthermore, the depth and distribution of the dusty regolith on planetary bodies affects infrared observations. Most importantly, any human or spacecraft activity on planetary bodies is affected by dust. Spacecraft will release dust upon impact with the surface, which can interfere with the operation or sensitivity of instruments. Surface activity can agitate dust and inject particles into the photoelectron layer, possibly causing contamination of instruments. Hence, investigation of the charging and dynamics of dust near planetary surfaces is a necessary component of future manned and unmanned exploration of the solar system. Figure 1. Surveyor image of the western lunar horizon shortly after sunset. The white arrow is pointing at a layer of dust levitated ~ 1 meter above the surface. Background on photoelectron sheaths and dust charging: Objects in space charge to a floating potential determined by the balance between charging currents in the local plasma environment. Charge transfer continues until the sum of the charging currents is zero and the object has reached an equilibrium value. Surfaces in space that are exposed to high-energy photons from the sun emit electrons due to the photoelectric effect. These emitted electrons form a photoelectron layer, or sheath, near the surface. Typical sheath dimensions are tens of centimeters to one meter at distances of one AU. Dust grains on a planetary surface can also become charged due to photoemission. Particles that are ejected from the surface by external disturbances, such as micrometeorite impacts or human/spacecraft activity, can become charged by photoemission and electron collection when immersed in the photoelectron sheath. Then, particles can be levitated in the sheath when the Lorentz force balances gravity and can be transported vertically and horizontally above the surface by electric fields in the sheath. In addition to particles becoming charged due to photoemission or collection of electrons from a sheath, dust can also be triboelectrically charged. Triboelectric charging refers to the charging of grains via contact. This charge may accumulate and can result in potential differences of kilovolts. Triboelectric charging is rarely discussed for grains at rest but is frequently invoked as a mechanism for charging of windblown grains. On Earth, strong electric fields in dust devils and lightning discharges in volcanic plumes are thought to result from triboelectric charging. This process may play an important role in electrical discharges from dust storms on Mars. Experiments: We have produced and characterized photoelectron sheaths above metal plates of various compositions. For a typical photoelectron emission of 20 mA, the photoelectron density immediately above the surface is 4 x 104 cm-3. This density is doubled when the photoemitter is held at floating potential and emitted electrons return to the surface. A typical energy distribution for this apparatus peaks at ~ 1.1 eV with a full width of ~ 2 eV. We have also done studies on the electrostatic charging of dust grains. Conducting particles (zinc, copper, graphite) typically charge a few volts positive when exposed to UV light and a few volts negative when they pass through a photoelectron sheath.Nonconducting particles (SiC, glass, lunar regolith simulant, martian regolith simulant) have a triboelectric charge distribution of up to ± 15 V, roughly centered on zero.These grains are weak photoemitters but attain a negative floating potential when exposed to a photoelectron sheath.Our results are consistent with charging theory and indicate that triboelectric charging may be the dominant charging process for planetary regolith analogs (see references). 3. to study the effects of external disturbances (simulating ejecta from micrometeorite impacts or human/spacecraft activity) on dust dynamics. We have developed plasma probes that are carried by rockets into the mesosphere for the purpose of finding charged aerosol particles. These could be either meteoric dust or NLC particles. The probe is simply a patch of graphite (about 2 cm x 6 cm) mounted flush with the side of the payload. The velocity component of the rocket transverse to the payload axis carries the particles into the patch. A circuit measures the current I to the patch. We can then find the density of particles using I = nevA where physics students will recognize the variables. The plasma has an equal number of plus and minus charges so you might think we could collect no net charge. However, we mount a simple permanent magnet behind the patch and push away the unattached electrons, which have a small Larmor radius and we collect the charge residing on dust particles. The Larmor radii of the dust particles is very large so the dust particles are not deflected. The atomic and molecular ions are deflected but not enough to prevent some detection of ions. Also, the collisions of these ions with the flowing neutral gas tends to overcome the magnetic force. So our probe doesn't separate ions from dust particles as cleanly as we would like. So we are trying to find the right amount of positive bias voltage to put on the patch to help get rid of the pesky ions. One of the most appealing aspects of dusty plasma research is that because of the relatively large size of the dust grains (as compared to the ions and electrons in the plasma), many of the phenomena in dusty plasma are both macroscopic (visible to the naked eye) AND have slow time evolution (~ up to several tens of seconds). This allows many dusty plasma phenomena - including features like waves and vortices - to be directly imaged. This gallery of photographs and movies highlight some of these phenomena. A color image of two separated dust clouds in DUPLEX. A "double" cloud observed in DUPLEX. Here the cloud edges were observed to be rotating in opposite directions. A "double void" in the PKE chamber. Tracks of particle motion through a void in the PKE chamber. Vorticies....imagine that longitudinal transmission with a soliton. Some one today thought longitudinal current was bunk. They also thought its a discredit to science to even talk about it. They said birkeland currents could only be DC. Thats funny considering a birkeland current by its very nature (spiral) is a longitudinal form. A tsunami is a soliton and a longitudinal wave (yet not a spiral) and just as real as the surface transverse wave....oh well, what you don't know could kill you. Meanwhile they talk like they know what they are debunking. Funny that a primary form of transmission could be so over looked. We are talking about coherent non linear energy transmission that is massive, we are not talking transverse, we are talking longitudinal in these regards. It is well known that hurricanes and tornados are spiral, they are also longitudinal forms. Longitudinal waves present as they are "longitudinal" ie tsunami or as a vortex ie hurricane tornado. Yet longitudinal to them is not valid concerning the EU. Thats funny that the EU is full of these forms then....wow....how do they miss it>>???? longitudinal wave transmission in the longitudnal form (tsunami) and I imagine galacticly via aether. They exclaim that longitudinal wireless transmission with Tesla patents as demonstrated and explained by Dollard is bunk. I guess Meyl is bunk too, since he does the same patent with solid state,minus the light bulb. Maybe Tesla was bunk about the physical effects of this type of transmission, the physical effects that Dollard also notices such as a pressure wave from the light. Meyl says its neutrinos. Tesla mentioned that no faraday cage could shield it. I have to say, I am glad for this public forum, its the place for me. I get something from it everytime. I can read nature very well now thanks to APM and the guy from Lockheed Martin Skunkworks, Boyd Bushman. Dusty Plasma must have these vortex forms....that is a fact. I know why that is a fact and I just explained why. Its a primary structre that transmits massive nonlinear energy in many mediums. Dusty Plasma is a coherent aggrgation of macrosized particles that allow us to "see" the underlying non material constructs and the structure that produces the function of transmission. You know why Tesla had that spiral coil? To transmitt. That is longitudinal transmission. Its valid, its primary, its faster then light because it is quantum entangled, its all very real. Once you begin to understand how this is a tensegrity structure via the contiunous tension of charge and discontinuous compression of the dust particles then you can explain why via EM and Tensegrity that it takes on these complex and replicating structures. Tensegrity is valid at all levels as is electicity/charge/magnetic fields.